1. 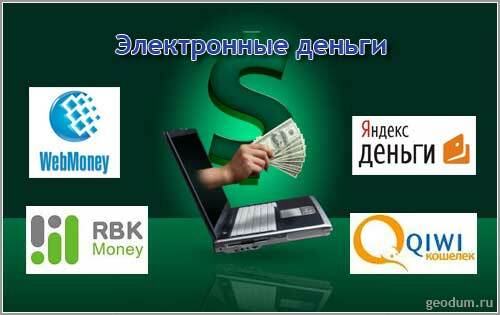 WebMoney Transfer. To become a member of the system WebMoney Transfer, you must install on your PC, PDA or mobile phone device, log in and accept its conditions, receiving a WM-identifier - your unique number. The registration process also provides the enter of personal data and confirmation of their authenticity through WM-certification. Each user has WM-Passport - an online document, based on the personal data. All transactions in the system are instant and irrevocable. 2. Yandex. The second most popular payment system in the CIS. Ensures the implementation of financial transactions between members of the system (individuals who opened accounts in the system) in real time. The currency - the Russian ruble. Is designed for the operation of e-commerce. The system provides the opportunity to work through a web interface or using the program-purse to be installed on your computer (this option is available only to users of Windows). 3. RBK Money (RUpay). Single payment platform works in real time and allows any operations with electronic money quickly and safely. In contrast to the WebMoney Transfer, you can not be afraid to forget their details in a notebook at home. The main purpose of RUpay - payment payments and purchases on the web, a withdrawal on account Ukrainian or Russian banks. RBK Money itself does not provide banking services. 4. Qiwi. Ltd. "Mobile Wallet" - progressive Russian IT company razvivayuschayaelektronnuyu payment system «QIWI Purse." The history of the company started in 2006 with the creation of the first payment application for a mobile phone - "mobile wallet". Service grew and in 2007 turned into an expanded loyalty program for terminal users QIWI - «Personal account QIWI». In 2010, the program has been finalized in the payment system «QIWI Purse" - a universal service for convenient purchases of goods and services. Today «QIWI Purse" is available for the whole of Russia in terminals QIWI, on our website and a mobile phone. 5. Dengi@Mail.ru,. System is limited only to the web interface. Payments shall be made from any PC, and the identifier is the email address. 6. RAPID. Originally worked only with financial institutions. Processing center Rapida connects to the billing company. In fact, the Rapida - non-stop service to receive payments for telephone, utilities and so on. The system allows you to set the interval for the monthly payments. 7. Z-PAYMENT. Billing system can successfully integrate many kinds of electronic payments and transactions into one coherent, logical system, which is easy to work with and friendly. In contrast to the above services, Z-PAYMENT does not compete with other electronic systems, and cooperating with them. Sign up for free, you will be able to work with all payment systems, banks, perform various operations with a non-cash, and cash. Guaranteed safety, no special software to users, the ability to contract, round the clock support - this is the Z-PAYMENT, which predict a huge success. 8. Perfect Money. Another convenient and secure service of instant electronic payments network. Is multifunctional: the system allows not only settlements between members or to perform various types of electronic payments, but also has its own deposit program, which allows you to securely store e-currency accounts and receive monthly interest payments on the balance. The advantages of Perfect Money - high security and round the clock technical support. 9. EasyPay. First Belarusian-bank system of instant electronic micropayments for quickly and no commissions to pay for utilities, mobile communications, Internet and television, as well as various other services through attached to a digital wallet card. In addition, the system gives the opportunity to commit a variety of banking operations, but the transfers of a commercial nature are not allowed (the transfer of money between individuals - owners EasyPay-purses are no problems with the commission 2%). The market is functioning since 2004, and in 2010 came EasyPay the Ukrainian market of online payments. 10. LiqPay. Ukrainian public payment service designed to transfer money, as well as making various kinds of micro-payment and online a wide range of services. The founder and owner of LiqPay is Ukrainian Privat that can take money from your account through the ATM network PrivatBank in Ukraine and Russia. High level of security of transactions ensures that service dynamic one-time password (sent in an SMS message to a personal account linked to the phone number) and technology 3D Secure code. Free transfers within the system. Transfers in ePassporte, Webmoney and Paypal. Bank details in various countries for transfers in USD and EUR. Conversion of funds within the system. Function of mass-payments for transfers in bulk mode (including ePassporte, Webmoney and Paypal). The automatic payment for goods and services. 12. W1. Wallet. W1 - another convenient and secure electronic service that allows registered users to transfer money between wallets without additional fees, as well as quick and easy to pay for different types of services. Access Wallet via any means of digital communication, with connection to the internet (computers, mobile phones, PDAs). Has an extensive partner network, which enables the best beskomissionnoy payment of a wide range of goods and services. 13. MoneyMail. Electronic payment system, popular in Russia and in existence since 2004. Registration at the open and free, as the account number here is the email address. At the time of the transaction in MoneyMail can be made in three types of currencies - the Russian ruble and the U.S. dollar and the euro. All operations are carried out in the system through the interface of the site, with additional applications to be installed. Among the main services - recharge mobile communications commission monthly payments, repayment of bank loans, transfer of funds to the e-mail and more. 14. IntellectMoney. A fast growing high-tech company, the organizer of the universal payment and discount system IntellectMoney. We are dedicated to the success of e-commerce in the market and are committed to the dissemination of online payment services of the maximum number of Internet users. We are confident that the current e-commerce - one of the fastest growing business sectors. According to experts, the annual growth rate of over 100%. These figures show that an increasing number of Russians were able to appreciate the benefits of electronic payment systems - their high reliability, accessibility for all users, the possibility of making payments from anywhere in the world where there is Internet access, fast money transfer, anonymity financial transactions. The main purpose of the company - to create a universal and secure payment environment and the development of special offers for the fullest satisfaction of our customers in the field of e-commerce. Ranked Among the partners IntellectMoney - shops giving discounts to users of the system, the largest Russian banks, operators, instant payments, and many other companies. 15. TeleMoney. A payment system that allows you to make secure payments on the Internet, as well as pay for any goods or services in shops, which are connected to the system. Detailed information about all of account, the ability to pay for both real and virtual goods and services available around the clock online at the TeleMoney. What is different from other TeleMoney payment systems? Of course, we could write a lot here about the reliability, security, convenience and efficiency of our system. It's all there, and no worse than others. However, it is necessary requirements for proper payment system. And the system or they are satisfied, or has no right to exist. The main difference TeleMoney from other payment systems is the existence of a unique system of motivation of active users. To put briefly, it can be expressed as "50% back on each payment." Yes, you heard right and ochitalis, we did go back 50% of every payment made by you. These funds come at the expense of basis, where they can at any time be spent on the purchase of goods or services in a specially created us shop "Restock". 1. International payment system PayPal. One of the most popular e-services world, gathered under the wing of more than 100 million users, celebrates his birthday on the same date as the WebMoney Transfer, - 1998. Owner PayPal - California-based "Palo Alto". In order for your online currency could work, you must register as a "Personal Account" and "My Prime account." Larger clients open "business expense." You can use PayPal with a PC, the Internet, mobile. Russians and Ukrainians can use this payment system to pay for purchases only. Online currency can not be displayed and received from other users. 2. AlertPay. Electronic payment system is originally from Canada, operating in the global market of electronic financial transactions since 2005. Simple and free registration will allow quick and hassle-free to open an account in the system. Account verification for residents of certain countries is problematic, however, the account can be used successfully and without verification, because it is voluntary. The identifier (account number) in AlertPay using e-mail, provided at registration. This includes the ability to transfer funds to users still do not have an account in AlertPay. 3. E-Gold. Appeared in the two years before the payment system WebMoney Transfer and PayPal. Security over one million accounts in E-Gold guarantee banks of Switzerland and the USA. This service - the universal tool that enables the exchange and transfer rates of any country in the world. The most indispensable payment system uses to exchange currency weights of palladium, silver, gold and platinum. E-Gold - ideal for serious business people who devote themselves to online commerce. 4. Moneybookers (Scrill). This young payment system (2003) operates in accordance with the laws of the United Kingdom. Feature of the system is that its users can easily, safely and cheaply exchange, money transfer and online payments in real time. Operations are carried out through e-mail. The currency with which you intend to work, you must select at registration. In Moneybookers indicate only your real data. No software installation is required. Now, send money from your credit card, get online currency at the e-mail, and to do any shopping on the web. 5. Google Checkout. Payment system from Google. Requires binding to a credit card customer. To use the service while they can only residents of the UK and the U.S.. In fact, Google Checkout does not make payments, and guarantee their safety. Operations themselves are made by bank card users. 6. Liberty Reserve. Widespread payment system incorporated in Costa Rica, received in 2007, while operating Liberty Reserve since 2002. One of the main advantages include high security - crack the account in the system is difficult to guarantee the safety of the account. All payments are carried out in the system are 100% but irrevocable (Refund function is missing), and the function package enables transfer of funds without wasting time to make electronic payments to multiple users on the system. The commission for the transaction between users is quite low (1% but not more than 2.99%). On my site I want to present you with the most detailed and complete description of almost all Russian Internet payment system in Russia and the CIS.